How did you come up with your Ref name/what does it mean: Kamikaaskop is a portmanteau of Kamikaze and Kaaskop: Kaaskop means Cheesehead in Dutch, and refers to people from my hometown, Alkmaar, tradecentre of cheese. Kamikaze because I’m not always as agile as I wish I would be… Since kami means divine or spirit in Japanese, my name would translate into Divine Cheesehead! 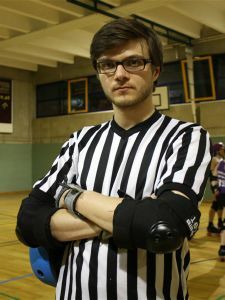 If you had the chance to create or change one rule what would it be: 5.5.6 – Extended touching (lasting three seconds or more) with the forearms or hands to an opponent’s legal and/or illegal target zone — I mean, come one, roller derby is a contact sport!